Below are more data sets and websites to explore. This data set (.tp) shows lengths and weights of 25 Florida alligators. Students can use this data to informally explore a cubic relationship. This data set (.tp) helps students visualize trends over time and explore relationships between attributes. You can also have your students add their data to this file. This data set (.tp) includes measurements of body temperature and heart rate for 130 people. This is a good opportunity for students to compare an accepted average for a population, 98.6 degrees Fahrenheit, with the average for a sample. This data set (.tp) includes measurements of 159 fish caught in a lake in Finland. 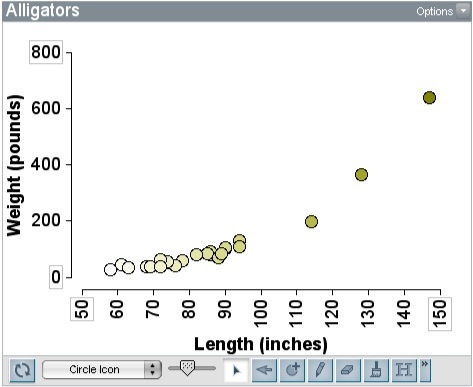 You can connect this data to geometry by having students use the measurements of individual fish to draw pictures of an average fish for each of the different species. We received this data set (.tp) from Michael Wilkinson, a sixth-grade science teacher at the Fieldston Lower School in Bronx, New York. Wilkinson's students gathered data relating to the Atlantic Ocean hurricanes from 1999–2004, using such sources as the websites for the National Hurricane Center, Weather Underground, and UNISYS Weather. Attributes include month, peak location, number of deaths, and maximum wind speed. This data set (.tp) compares college tuitions in 2008–2009 to 2010–201, using data gathered from the College Affordability Transparency Center at the U.S. Department of Education. The United Kingdom's The Guardian has a blog of current and interesting data, usually including downloadable data sets. Their full listing of alphabetized data categories can be found here. Students in grades K–12 study animal migrations and vegetation growth that signal spring's arrival. Data include those submitted by naturalists (migration of eagles) and by participating students (blooming of tulips, sightings of monarch butterflies). Unrestricted access to data. K–12 students collect and submit data concerning weather, water quality, and other areas of study for use by scientists. The students access the collective database, and construct maps and graphs from global images. Unrestricted access to data. This site includes whale and marine mammal tracking data, as well as curriculum suggestions. This site's curricula are built around a remote underwater sampling station that takes real-time measurements in several Minnesota lakes. The curriculum is targeted to advanced high school and first-year college courses in general science and environmental science. Unrestricted access to data.